three classes - established April 30, 1900, amended February 15, 1919 and October 11, 1919. (3) For manufacturers who have created or imported an industry or developed an existing industry. (5) For people who generously carried out work of public interest or founded charitable institutions. 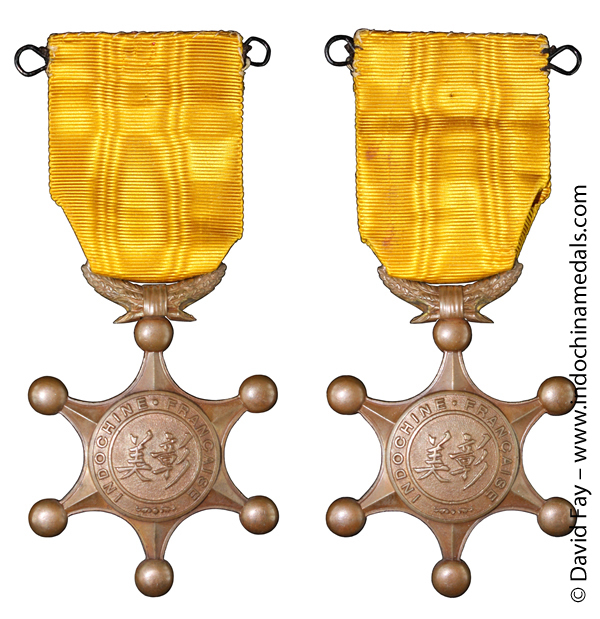 The Order of Merit was worn on the left breast, suspended from a yellow ribbon. 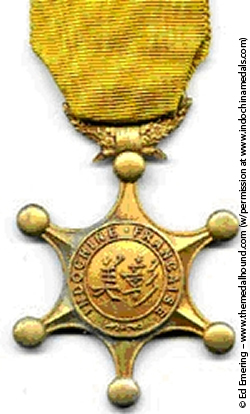 Except in the case of exceptional service or new services referred to in the order of nomination, no person could be appointed in the Order of Merit at the third class or promoted from one grade to the next grade until after five years. The holders of the Order of Merit of 1st, 2nd and 3rd classes had rank respectively in public ceremonies, of governor (tong-doc), prefect (phu) and subprefect (huyen). They passed immediately after the civil servants fulfilling the duties having these ranks or identical ranks. 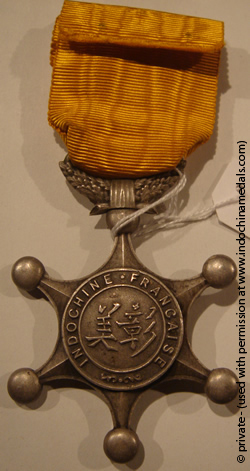 Nominations in the Order of Merit were made by the Governor General of Indochina, on the proposal of the heads of local administrations or directors and heads of general services, after review by the Council of the Order of Merit, and upon consultation of the Permanent Commission of the Council Superior of Indochina. The maximum number of nominations per year could not exceed 200, nor the full allowance of members. The Order was originally restricted to 10 recipients in First Class, 100 in Second Class, and 500 in Third Class, but was expanded by regulations of February 15 and October 11, 1919. Nominations were held once a year on January 1st, unless in exceptional circumstances which might require isolated appointments. 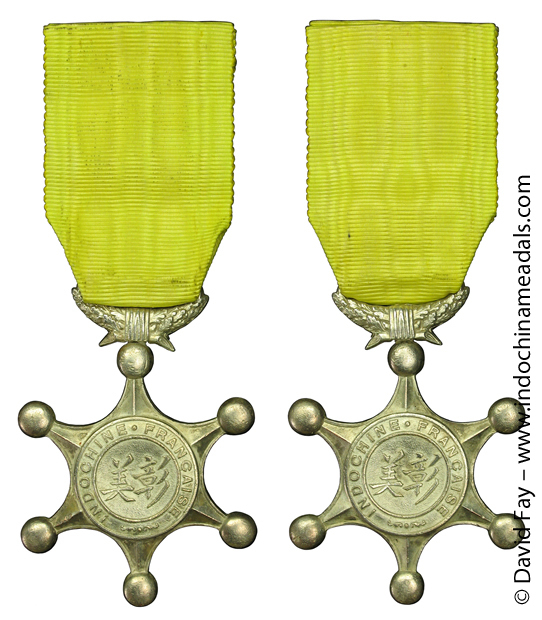 The Council of the Order of Merit was a permanent commission of the Council Superior of Indochina, under the chairmanship of the Director of Civil Affairs of Indochina, composed of four members appointed each year by order of the Governor General at least two who would be holding the Order of Merit 1st class. The Council of the Order was required to give its opinion on any proposal of nomination or cancellation of members, as well as on any proposed amendment to the statutes of the order. The Order and the certificate were provided free of charge to holders. The 1938 M. Delande catalogue offered the Order in gilt bronze for 45 Francs, silvered bronze for 40 Francs, and bronze for 36 Francs. Examples are known with a swivel suspension and also with a fixed suspension.